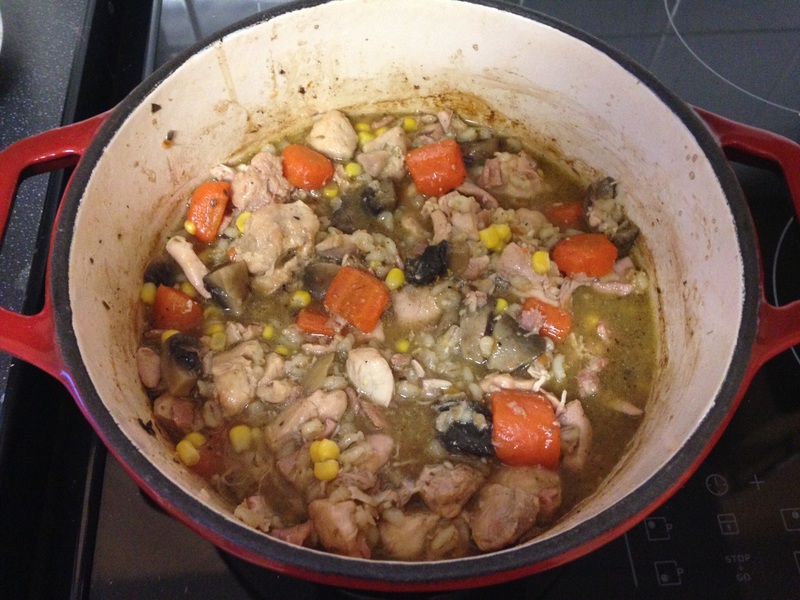 Our Sunday meal this week was a chicken casserole. I love casseroles because pretty much anything goes. 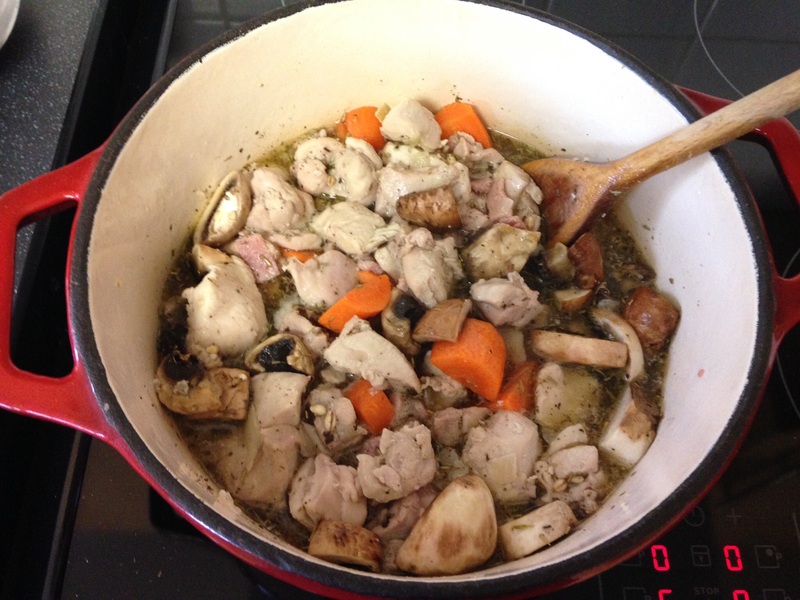 Chuck together some meat, veggies, stock and flavouring, and it should result in a tasty casserole. My casseroles are often made up as I go along. Unless I’m following a recipe, chances are they’ll be different every time. Again, it usually depends what’s in my cupboard and what I need to use up. This time I cooked it in the oven – I’d left it too late to slow cook, and with chicken it doesn’t really matter. But I love my slow cooker, and any other meat (e.g. beef, lamb) which you’d want really tender, I tend to slow cook. It’s a lot cheaper than running your oven for several hours – apparently running a slow cooker is like leaving a light bulb on?! When cooking, it’s useful to think of what flavour combinations go together. In this instance, chicken and bacon is an obvious one. When it comes to adding flavour, think of what you’d normally associate with chicken. 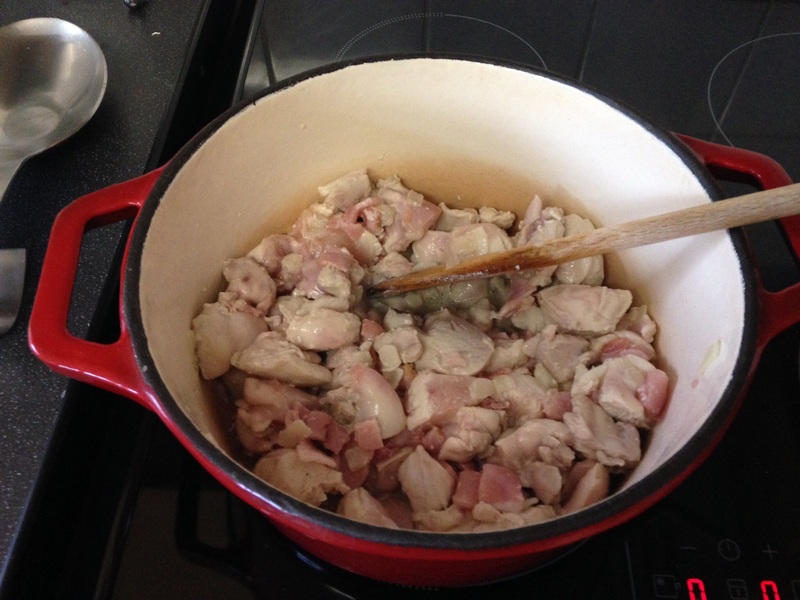 For example, I used sage – think of the sage and onion stuffing you’d have with your roast chicken. I also used rosemary and thyme (these go well together anyway) but not as much as the sage, because they’re quite strong flavours. I tend to smell herbs before I add them, to get an idea of how much I want to use. What do you want the overriding flavour to be? Does that makes sense?? 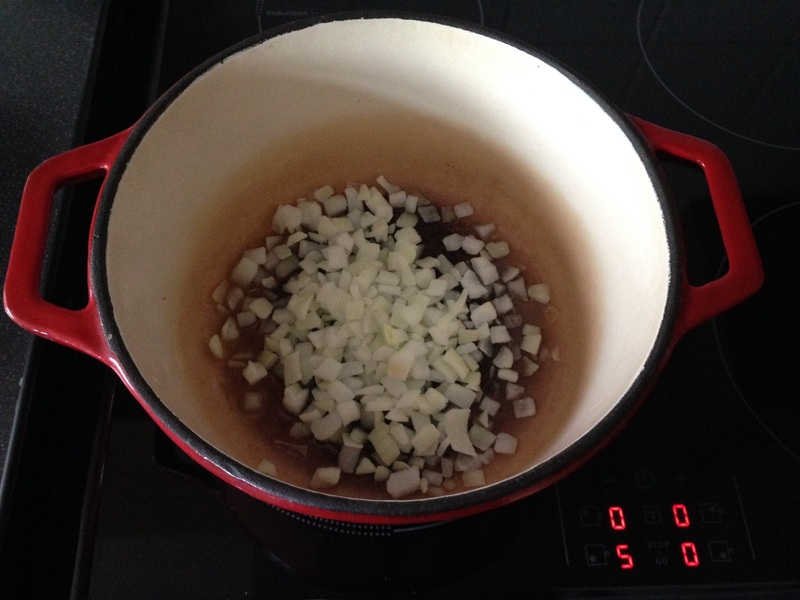 Add a tablespoon of oil to your pan and soften your onion (again I used frozen onion for this). Then add your chicken (chopped into bite size pieces) and cook it long enough to seal it (i.e. till it’s mostly turned white but not cooked through). I used both breast and thigh here because the kids prefer the texture of chicken breast, but thigh adds a lovely meatier flavour. Add your bacon and let it cook for a few minutes. 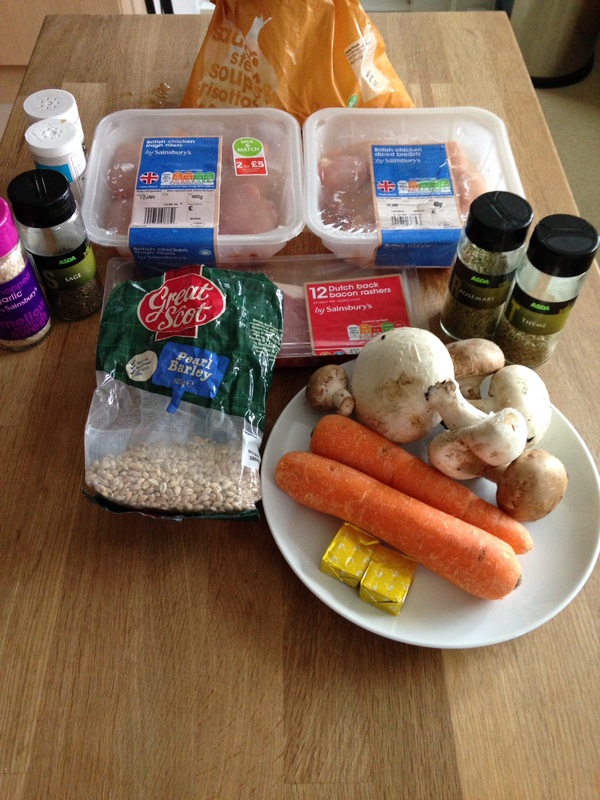 Add your veg (whatever you fancy really – I’m a big carrot and mushroom fan) and the pearl barley (this thickens the casserole without the need for any thickening agents (i.e. flour) so can be useful if you’re following certain diets! ), then add your herbs, seasoning and stock. It’ll look like a lot of stock but you’ll need it because the barley will sook it right up. You can always add more stock if your casserole looks like it’s getting a bit dry. And don’t be scared of seasoning. Unseasoned food is flavourless food. Chuck this in the oven at about 150C for about 2 hours. You’re really just waiting for the meat to cook, and the veg and barley to soften. Take it out at least once halfway through to give it a right good stir. It’s maybe not the most glamourous looking of dishes, but it really is a lovely, warming winter meal. I served it with creamy mash, roasted veg and steamed cabbage. This was a pretty big casserole and did us two nights, so would normally serve at least 6 adults. As a quick aside, do you know what possibly the single most important part of cooking is? Tasting your food. That might seem obvious, but a lot of folk don’t. And if you don’t taste your food, how do you know it’s even edible? Is it too salty? Not seasoned enough? Have you totally missed an ingredient? Before dishing up anything, make sure you taste it. Right, my girls appear to be reverting to their early days and think it’s a good idea to get me out of bed several times a night. So I’m off for a sleep.